Motorola MC40-HC - Health care BLUE, WLAN, ANDROID KITKAT, PTT/VOIP TELEPHONY READY, SE4710 2D IMAGER. Interface cables and charging cradle sold separately. Single slot charging cradle (Part# CRDMC40XX-1000R) requires power supply (Part# PWRWUA5V6W0WW) and USB communication cable (Part# 25-MCXUSB-01R). Five slot charging cradle (Part# CRDUNIV-40-5000R) requires power supply (Part# PWR-BGA12V50W0WW), DC line cord cable Cable-DC-388A1-01 and AC line cord (Part# 23844'�00'�00R). Your health care staff wants the latest in mobile technology, and a device that is as fun and easy to use as their own smartphone. Your health care organization requires an enterprise-class feature set, from data capture and security to manageability and dependably robust wireless connections. Get it all with the MC40-HC: Android, the most popular mobile operating system in the world, world-class enterprise data capture capabilities, and Extensions from Motorola Solutions, which adds enterprise-required features that are missing from standard Android. 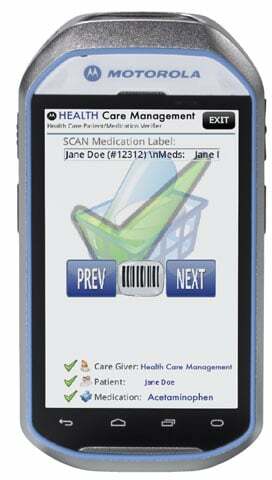 The MC40-HC - empowering your health care staff to deliver the best possible patient care. The Motorola MC40N0-HLK3R01 is also known as MC40N0-HLK3R01	or MC40N0HLK3R01	.